Regulation of this complicated work is under control of nervous system and special blood messengers - digestive hormones. Stress, fasting, "harsh" liver cleansing, gallbladder removal, bad eating habits, alcohol, some medications, and recreation drugs badly influence in proper regulation and work of the sphincter of Oddi. Tumor, gallbladder stone, or scaring can make an anatomical blockage of the sphincter of Oddi. It happens relatively rare. However, more often can be functional, temporal spasms of the sphincter of Oddi without any abnormality in the tests. The common reason for sphincter to be spasmodic is irritation of it by the "aggressive" bile and pancreatic juice. What could make bile and pancreatic juice "aggressive", corroded, and irritated? Let's explain that. The liver's most important functions are producing and releasing bile and removing the toxins from our body by dividing them into water-soluble and fat-soluble wastes. Hepatitis, fatty liver, Candida-yeast overgrowth, parasites, congestion, inflammation, infection of the gallbladder, high body's acidity, poor eating habits, alcohol can cause the bile to be thick and acidic, therefore make it difficult for it to move through the ducts. 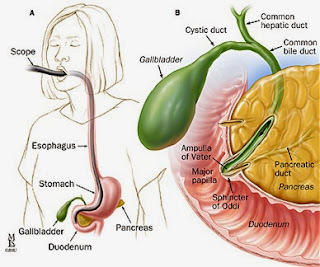 When the bile and pancreatic juice are getting acidic, they also become very "aggressive", irritated, and corroded for the ducts, sphincter of Oddi, and small intestine causing jerky movement; "wrong way traffic" - bile/pancreatic juice refluxes in the stomach, ulcers and even cancers. No surprise, it causes loss of appetite, nausea, gas, bloating, heartburn, attacks of pain, especially after "bad" foods or bad food combination. Pain can be last for 30 minutes to several hours and even bring person to ER. Therefore, the goal of treatment has to be focus on root of the problems such as biochemical, acidic changes in the bile and pancreatic juice. In the normal situation, the bile and pancreatic juice are very alkaline fluids. However, if whole body is getting acidic, the bile and pancreatic juice also became acidic and "aggressive". European doctors showed that drinking mineral water makes bile and pancreatic juice less acidic, liquid, and less "aggressive". It naturally improves digestion, alleviates the pains and cramps, and lessens gas and heartburn. Herbal medicine is the oldest way to eliminate digestive problems. Chinese medicine, Hindu system - Ayurveda, European herbology offer many healing herbs for digestive disorders. Some of them increase amount of the bile, promote its easy elimination, decrease spasms and pain. The simple example is peppermint tea. Knowledgeable medical practitioner can customize the herbal remedies for any digestive problems. By author's opinion, strategic position of the sphincter of Oddi involves it in many digestive diseases and disorders. On the other hand, sphincter of Oddi dysfunction by itself leads to many digestive symptoms. Peter Melamed, Ph.D. received his medical education first as a registered nurse and then as a medical doctor in Russia. He took specialized training in anesthesiology, intensive care, and internal medicine. Working as a physician he became interested in holistic healing through his clinical experience with herbs, acupuncture, healing mineral water and internal cleansing. He was granted a license to practice acupuncture in Russia in 1978, and from that time he combined conventional Western medical treatment with herbs, acupuncture, and other non-drug healing therapies. 1. Natural European Way of Whole Body Cleansing. Karlovy Vary Mineral Water for Healing and Rejuvenation. 2. Healthy Pancreas, Healthy You.